Crystal Mountain: There are literally flowers everywhere! Since Crystal is in the national forest, it’s people & dog-friendly — and the Mt. Rainier Gondola is even dog-friendly during the summer! Crystal Lakes Trail: The Crystal Lakes Trail between lower Crystal Lake and upper Crystal Lake has incredible flowers. It’s a workout, but we don’t think we’ve ever seen the wildflowers more beautiful. 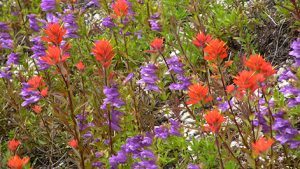 Grand Park via Lake Eleanor: Lupine, Indian paintbrush and more. Reports from this weekend indicate very few bugs, but as the summer progresses, make sure to go early in the day or bring spray. Sheep Lake: This trail is great for early wildflowers, and they’re just now starting to pop! Because this trail is in the national forest, it’s people & dog-friendly. Dege Peak: Some nice blooms along the trail, especially Indian Paintbrush. Berkeley Park: Some gorgeous displays, especially lupine and Indian paintbrush. Glacier Basin: Gorgeous flowers as you enter the sunny area past the intersection for the trail up to Burroughs Mountain, and in the basin. Make sure to view the Wildflower Viewing Tips to make your wildflower adventure truly memorable. We always recommend the Washington Trails Association website for recent trip reports, as hikers report what they see. Visit wta.org and enter the hike you’re considering. Please consider donating or joining their organization. They are a great resource for all of us!